There has been a lot of press related to Alpine Electronics’ new iLX-F309. Since its debut at the 2018 Consumer Electronics Show in Las Vegas, retailers and consumers have been waiting patiently for the floating 9-inch single din touch screen featuring Apple Carplay and Android Auto. In a previous article, we criticized Alpine’s “restyling” products for various OEM applications not due to its fit or finish, which are absolutely beautiful, but due to their huge price tag. But the “restyling” products might be a little ahead of their time. With OEM vehicle manufacturers using 8 and 9-inch screens in their OEM applications, why would a consumer want to downsize to a 7-inch screen? 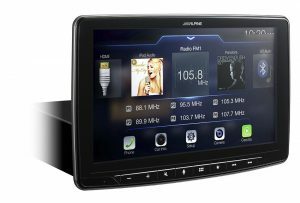 In the past, most consumers would upgrade from a single din head unit to a double din unit, going from a 3-inch by 1-inch screen to a 7-inch video screen. For many people, this was a huge upgrade both visually and in features. We have asked this question to many head unit manufacturers, why not a larger screen than 7-inch? They would all say, “It’s due to the OEM opening in vehicles”. Alpine Electronics just shattered this mold. They really thought outside the box, they managed to use the standard 2×7 inch single din opening, that has been around for over 30 years and integrated a whopping 9-inch touchscreen. Consumers can now have features like Carplay and Android Auto and a full 9-inch touch screen in almost any vehicle built since 1984 when the single din standard was adopted. This opens up a huge new customer base that previously could not use a double din radio to add a video screen. We really think Alpine Electronics really hit the ball out of the park on this radio. Alpine was a dominant force in the after-market head units during the late nineties and early 2000s. And it looks like Alpine Electronics is innovating again and have taken everything they learned from their “restyling” category and applied it the iLX-F309 Halo9. It looks like Alpine is back.